“On behalf of FEES and the Organizing and Scientific committees, we hereby inform you that due to the great interest and queries made by large number of participants, the deadline for abstracts submission is extended to the 1st of January 2016. 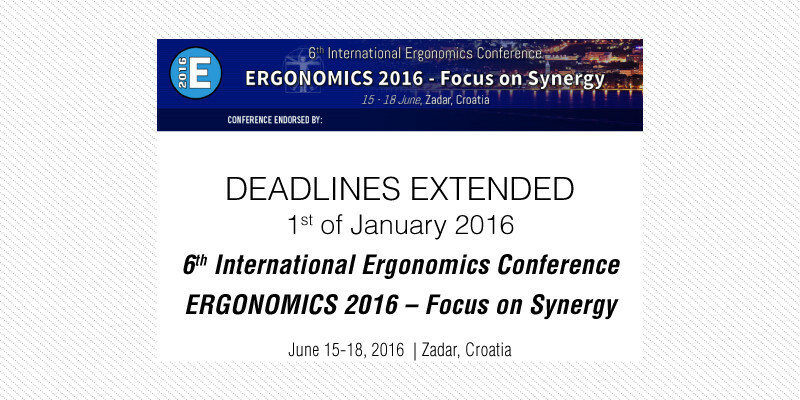 6th International Ergonomics Conference Ergonomics 2016 – Focus on Synergy will take place from 15-18 of June 2016 in Zadar, Croatia. Authors are invited to submit original and previously unpublished research papers for oral and poster presentations and/or to make proposals of original research presentation, challenges, solutions, and technologies within field of ergonomics. Participants are mandatory to fill in the registration form before abstract submission, following guidelines from our website. All accepted papers will be published in the Book of proceedings with ISSN 1848-9699 number. Do not hesitate to ask for more information at ergonomics2016@gmail.com (see attached Second Call for papers) or visit www.ergonomics2016.com).